Beautiful converted barn, perfect for a relaxing holiday, whether you are a family, couple or friends, the house and area has something to offer everyone. Golf, walking, hiking, paragliding, cycling, swimming, sailing, water sports, skiing and snow shoeing in the winter, shops, cafes & restaurants are all within 5 kms. The garden and patio are ideal for summer al fresco dinning and a perfect spot to relax and watch your children playing in the safety of the enclosed garden. The house is fully equipped to make your stay as stress free as possible, a home from home. 50 mins from Geneva, 15km from Annecy centre, this is a perfect place to come and unwind. We are an Franco-anglo couple, my husband is French and I am British, we have 2 young boys 4 & 6 years. We have travelled extensively over the year but decided to make our home in Annecy, its my husbands home town and I fell in love with the area before we had even met. We fell in love with the property even before it went up for sale, its has so much character and charm and the garden is perfect for our 2 young boys. Its close to all local amenities, lake, ski fields and the golf course! Giez is such a pretty village, traditional giving a true feeling of being in the mountains, close to the lake and to nature. Its a great location with small children, safe and quiet with lots of things to do on the doorstep. 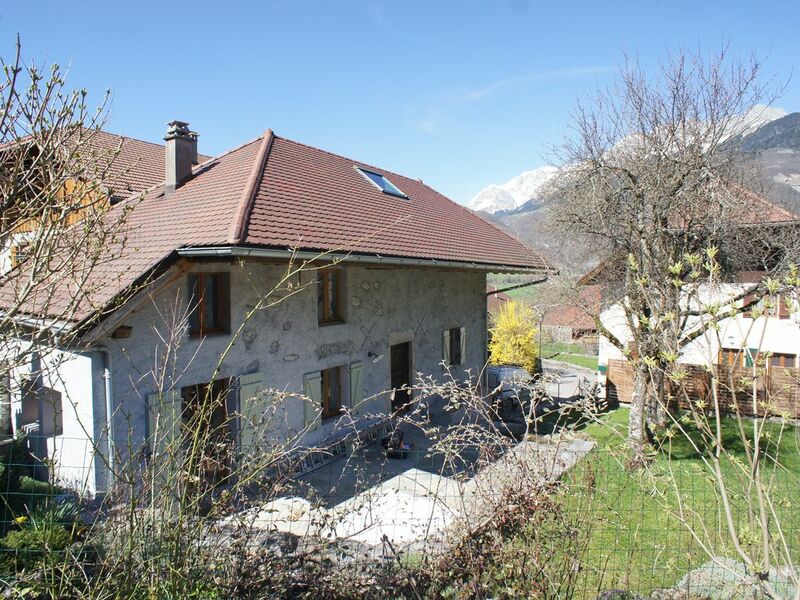 We like to think our home will give you all the comforts of home whilst being spoilt by the beautiful countryside and town of Annecy. We hope to make your stay as stress free as possible. Ensuite bathroom to bedroom 1, Small ensuite WC & shower shared between bedroom 2 and 3. Comfortable lounge with exposed beams and mountain views, flat screen TV, DVD home cinema system, Ipod docking station, selection of DVDs and books. Sunny dinning room, with large farm house dinning table, bench and chairs. Free WI FI. Dishwasher tablets , washing up liquid and clean sponge offered. Tea, sugar, salt & pepper, herbs & spices and oil. Fully equipped modern kitchen with cooker, oven, electric hob, fridge freezer,dish washer, washing machine, coffee machine, kettle, toaster, microwave, various pots, pans, casseroles and utensils. Opens out onto patio and garden. Large selction of books (mainly English, French with 1 or 2 dutch). Pretty south facing enclosed garden. 3 basic adult town bikes but only 2 helmets and locks! The closest Marina is Doussard. A Variety of boats can be hired from every beach around the lake (please ensure you have the correct licence with you for hiring larger/faster vessels). Large south facing terrace with 2 sun loungers and dinning table set with parasol seating up to 8. Tennis clubs situated all round the lake, courts and equipment available to hire from club. Giez Golf Course, 9 & 18 holes plus practice area, driving range, buggies and club house. Fantastic and interesting course, never seem to tire of this one always a challenge 200 meters from house, set of golf clubs available for use. Talloires Golf Course 18 holes, lake views, club house and practice area 10 mins drive. Le Grand Bornand - (Le Rocher Blanc) 9 holes, scenic, tight and challenging course, possible to do 18holes. Courchevel and Megeve golf courses 18 holes 45mins drive, Alpine golfing at its best. Notes on accommodation: The house is suitable for families with young children we can provide a selection of baby equipment (high chairs, travel cot, back pack, bouncy chair, children's toys, games and books. The garden is enclosed. The house has central heating through out and under floor heating in the kitchen. Outside: Enclosed garden with large patio area, garden furniture with parasol, 2 sun beds and BBQ. Utility Room: Washing machine, iron, ironing board, clothes horse, vacuum cleaner, hair-dryer, hoover, mop and bucket. Cleaning / Towels / Linen / Maid service: Bed linens and bath towels provided, please bring your own beach towels. End of stay clean is included. Other: WI Fi through out the house, also a small garage where you can store bikes, golf clubs, skis etc. Set of golf clubs and 1 adult bike can be used, Kids kit available, ie high chair, cot, toys etc. We enjoyed our stay in Giez in this very comfortable house. The house was as described on the website, with a view of the mountains. The village is a very typical small French village; we found it very peaceful. We made good use of the patio and bbq area. There was lots to do around the lake; our children particularly enjoyed the high ropes course in Talloires and the toboggan at La Sambuy. Thank you very much. Just back from two weeks stay at the property and I can't sing it praises enough....the house was perfect for us (two adults and three teen children) the kids monopolised upstairs (two bedrooms and lounge) and my wife and I downstairs with our own bedroom and en-suite. Living "areas" outside were spot on too...the garden is not directly overlooked and perfect for a bit of a chill out and eating outside (we BBQ'd every night). The cycle trail is about 1 km away and local shops etc a 10 minute drive. Being in the centre of the village was very colloquial but also peaceful....the cows commute through the village every day and are close enough at night for the bells to usher you to sleep. We had an amazing time in Giez. The house is so cosy and beautiful and we had everything we needed and more. The scenary is beautiful, the perfect place to relax. Quiet location apart from the maniacal bell ringer!! Well equipped and clean. Upstairs shower room was very cramped and with children in mind, for which the cottage catered very well, the water was dangerously hot. Natalie and Francois were very helpful following our lost luggage saga. Great location for visiting the French Alps. The maniacal bell ringer Ray mentions is the village church bells, that feature in every village, town and city in France, they ring on the hour and in Giez they stop ringing during the night, unlike most villages when they ring 24hrs a day. As Ray points out the house is very clean, well appointed and located. The shower room is small but functional and allows a second bathroom in the house, but I feel our pictures clearly show this. The hot water temperature can be changed, it had been turned it up on request from a previous guest. All the taps are mixer taps so the temperature can be regulated. We were very helpful assisting Ray and his wife, calling several times on the night of their arrival to ensure they were OK and helping out wherever we could. We called them again on the Sunday morning to see how they were (they spent the night at the airport due to a delay and lost luggage). I offered to go and do a food shop, to the only shop that is open at that time of year and is out of our way (supermarkets in faverges are open on a sunday from start of July until end of August) so they had one less thing to worry about and could relax upon arrival. Francois went down to the house to greet them and to make sure they were comfortable. They asked me down to the house one morning to help them due to confusion over the delivery of their luggage, taking time out of my working day. All of the above we did because we care about our guests and dont mind helping out where we can, I have to say we are slightly baffled by the 3 star rating! Lovely house, great location for the lake and skiing. We stayed at the property for a week during half term as an introduction to skiing for our 3 children. It is ideally located for a 20 minute drive to the slopes of La Sambuy, or you can catch the bus that goes there twice a day. So we spent the mornings at Lake Annecy and the afternoons skiing! The accommodation is lovely, well decorated, warm and cosy and with lots to keep the kids amused. Thank you to Natalie for meeting us the next morning after we arrived late the previous night due to the drive from Calais, to help settle us in and orientate us to the area. You have a gorgeous house and just let us know if it comes up for sale! Lake Annecy is 5 mins drive or a short bike ride from the house. The lake is a great place to swim during the summer, there are many beach locations situated around the lake offering snack bars, water sport rental and life guarded swimming areas. Booking Notes: 25% deposit, full payment 8 weeks prior to arrival, 500 Euro security deposit. End of stay clean included. For full details please contact owner direct. Changeover Day: Contact owner.